One fascinating thing about real history is the nature of knowledge. I was having a big nerdy talk with a friend today where she was recounting some history about ancient classics that had been lost and the variety of really interesting people who recovered some of them and what that meant. It's the kind of history that's instantly recognizable because, well, nerds are always nerds, even in the pre-renaissance. 4chan has nothing on classicists bitching about each other's Latin translations. This seems like it should be really gameable, but there's weird barrier that I have never really found a solution to. The problem with the history of knowledge is that it's full of questions we have already answered. That is to say, the discovery of an ancient greek text that lays out atomic theory along with its philosophical implications doesn't really get the pulse pounding (unless you're already a certain type of nerd). And maybe that's a necessary shorthand. If you're going to assume minimal setting buy in from players, then you want secrets that carry their own weight without needing context to give them meaning. Tentacled horrors are an easier sale than the invalidation of heliocentrism. The former can drive action, the latter not so much. Still, while that provides some motivation for more real secrets, I'm not sure that provides much in the way of guidance for making them any more playable. But what it does suggest to me is that maybe it's worth the extra work. - Ok, there's one solution: have Ken Hite at your game table. Sorry about the hiatus, folks. Work is into a crunch and I am lucky to get to the end of the day with enough energy to watch TV, much less put pen to paper. Still, trying to wrestle this beast to the ground, since I don't want this idea to wither on the vine. So, where were we? Ah yes, magic. Magic, I admit, breaks the simplicity of things a little bit. Magical characters are just a little bit more fiddly than others, but there are a few good reasons for this. First, this is a very open ended system, and that's good and bad. See, it would be entirely possible to just hand a wizard a couple of dice that were called "Fire", "Ice" and so on and leave it at that, and in a lot of circumstances, that woudl work just fine. Players could get creative in theor descriptions and all woudl be well. That would certainly be the easy solution (and if it comes to it, it's a fallback) but I feel that doing that runs the risk of exposing too much of the system - if there's no mechanical differentiation, then the distinctions can seem thin. This might not be too bad a thing in its own right if we were talking about more mundane things like knights and ninjas, but magic (I think) should feel a little bit different. Making it mechanically different helps underscore the idea that it's something special. Lastly, it's something of a tradition for magic to be a little bit more complex. I don't want to go full on Old School "Casters are the choice for those with system mastery" route, but at the same time, I want to acknowledge that. So it's with that in mind that magic becomes the excuse to dip into the bag of tricks and come up with some of the fiddlier applications of the dice. I've talked about these extensively in the past and you'll see a lot of those tricks in play. So, let's begin with the Black Mage, a staple of games. Aside from their cool pointy hats, there are really two things that define black mages conceptually. 1. They cast elemental spells (usually fire, ice and lightning, sometimes ohters) which have a naming convention that reflects incremental increases in power (such as Fire, Fira & Firaga) and are often area attacks. 2. They have a pool of Mana that they draw from to fuel their magical effects, which they deplete in doing so. The multi-target rules I've been considering pretty much boil down to this: Sacrifice some number of dice from your pool and add a number of targets based on the die size. d6=1, d8=2 and so on (I might step this down by one after its tested). Easy solution is to give black mages a bonus d8 that can only be spent for adding targets, so the BM can usually attack 3 targets. Ok, simple enough, but what determines which spell level the mage will be using? I suspect the baseline is probably level-1, so a Black Mage d10 can cast fira (d8) til the cows come home. Now, note that this means that Mages are often going to have slightly larger pools of dice (since they'll be doing Stat + class + Weapon + Spell rather than Stat + Class + weapon) so they're going to have fewer things to do with those dice. We might have some specialized casters who play with this dynamic, but the black mage is pretty much a brute force character. So we bear that in mind when we start thinking about Mana. Obviously, the easiest thign to do with Mana is just say "start with a die equal to your level, step down every time you cast a spell." Makes spells a limited commodity, and pretty much assumes the Black Mage will be casting the most powerfuls pell he can at any given time (which is probably a fair assumption). Simple, efficient, but a bit dull. So, one of the things I liked about 4e was the change to spellcasters brought about by the introduction of at-will powers - the fact that the mage could throw around magic missiles right and left meant you never got to the point where there was nothing for that player to do. I'm not looking to exactly capture the mechanic, but I like that idea, so I want the black mage to still be able to do _something_ if mana runs down. 1 - Clearly, this is not the only way to do magic, but for the purposes of CRPGs, it fits the bill. 2 - Or maybe a die equal to their black mage level. Not sure. 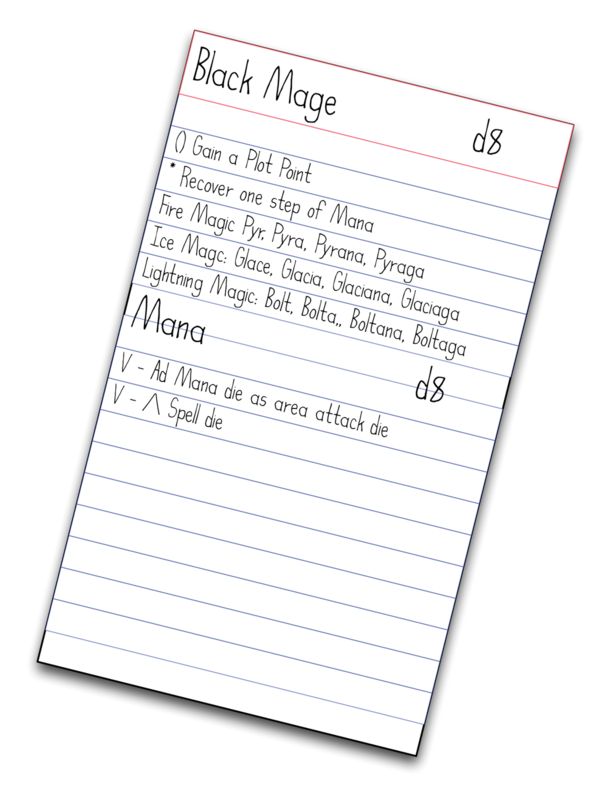 3 - Totally random idea I might use for an oddball magic class - Mana could be a fifth stat, and using it basically declares that you're spellcasting. It doesn't fit into the advantage/disadvantage matrix, but it may have its own complications.